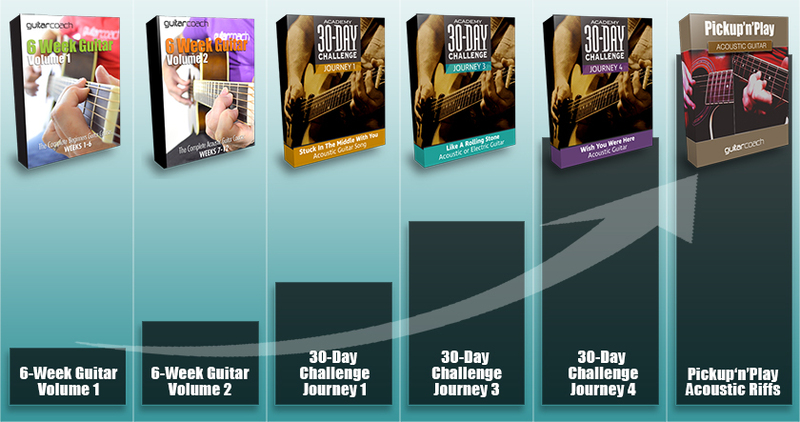 Take the next step towards becoming the guitarist you've always dreamed of. With Courses and Lesson Libraries for both Acoustic and Electric Guitar, The Academy will grow your skills, motivation and confidence for learning and playing new songs, or soloing and improvisation. The Academy is where you will find the structure, guidance, and support you need, to propel you forwards on your guitar playing journey. Firstly for Acoustic players, we have structured courses that cover the entire journey from complete beginner to intermediate level player. So no matter where you are on this journey, you can either take a step back and refresh your skills, or push ahead to new challenges. Our integrated courses and lesson libraries will totally remove the guesswork of what to learn next and give you a step by step plan to follow, and a clear goal for you to achieve. For electric guitarists, The Academy provides the structure and support to progress your skills in either soloing or songs, from beginner level through to intermediate level. The Guitar Coach Academy will provide you with clear tuition and structured lesson plans, to minimise your learning time, and maximise results, whether you’re learning new songs, mastering skills, or developing your playing style. So if you’re playing has hit a plateau and you’re looking for that next step to not only reignite your passion for playing, but also to give you some real structure, focus and clarity to your learning, then now’s the time to take a very small step forwards and open up a whole new world of learning. So for the next 30 days, dive into the Academy. Try some of the exciting and fun courses and programmes. Watch and download videos, tab books and backing tracks if you wish. Really try everything out and just have some fun, and experience what being part of the Academy can do for your guitar skills. Once your 30 day trial period is over, we will automatically upgrade you to a full Academy member and you will be charged the normal low monthly fee of just $19.95. But if you cancel within the 30-day trial you only be billed $1. There are no tie-ins or contracts. Your membership can be cancelled at any time, by simply contacting the Academy support team via the green “Help?” button which is on every single page of the Academy membership site. It’s quick and easy, and we’ll always be delighted to help and assist you. 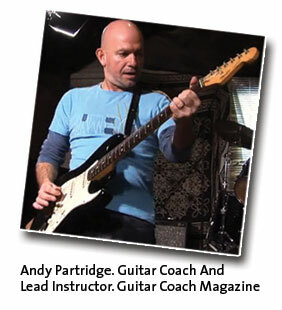 In addition to the above courses, you’ll also find all the content, articles and lessons from Guitar Coach Magazine, plus many additional lesson libraries covering skills, techniques and playing styles. Fantastic Value And Great Results. Guaranteed! Your Purchase Today Is Covered By Our Full, No Risk, 30 Day Money Back Guarantee. Your Payment Today Is Only $1. But If You’re Not 100% Satisfied With Your Purchase, Please Request A Refund. Just Click The "Help" Tab, Which Is On Every Page Of Our Site. You Do Not Need To Give Us A Reason. It’s Simple, Easy and Instant. 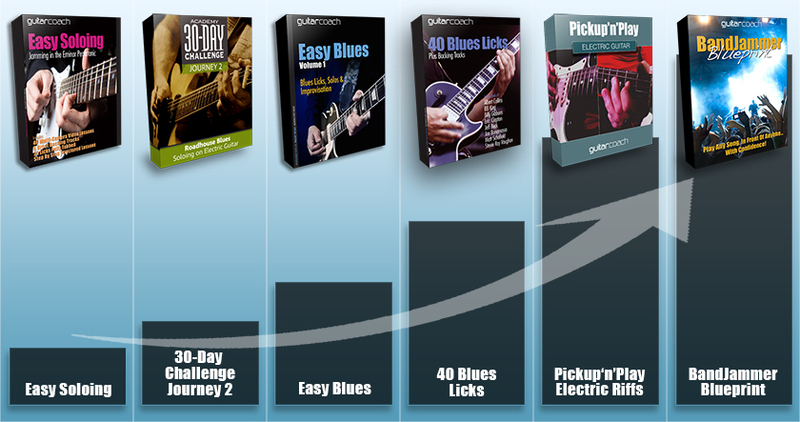 Once you have completed your purchase you will automatically be redirected to the Guitar Coach Members site where you can get instant access to the Academy. You're Fully Supported, Every Step Of The Way. Once your 30 day trial period is over, we will automatically upgrade you to a full Academy member and you will be charged the normal low monthly fee of just $9.95. But if you cancel within the 30-day trial you only be billed $1. There are no tie-ins or contracts. Your membership can be cancelled at any time, by simply contacting the Academy support team via the green “Help?” button which is on every single page of the Academy membership site. It’s quick and easy, and we’ll always be delighted to help and assist you.